Mohammed's Attitude Toward Jews of Medina. Second sacred city of Islam; situated in the Hijaz in Arabia, about 250 miles north of Mecca. It is celebrated as the place to which the Hegira (Mohammed's flight from Mecca) was directed, and as the capital and burial-place of Mohammed. According to Arabic tradition, Yathrib and the Hijaz were originally peopled with Amalekites, who were displaced by the Israelites. There are different accounts as to when this displacement was effected: some say that it occurred under Moses (comp. "Kitab al-Aghani," iv. 263); some, under Joshua; and some, under David, who it is stated resided in the Hijaz during Absalom's rebellion. Jews may have settled in the Hijaz after the sack of Jerusalem by Nebuchadnezzar; and it is probable that they came in successive colonies, e.g., after Pompey's attack upon Judea (64 B.C. ), after Titus' conquest of Jerusalem (70 C.E. ), and again after Hadrian's persecution of the Jews (in 136 C.E. ; see Arabia). The Jews had a very rich and flourishing settlement at Yathrib and built strongholds in the city and vicinity. The principal families were the Banu Ḳainuḳa', the Banu Ḳuraiẓa, and the Banu al-Naḍir. The latter two were known as the "Al-Kahinan," because they traced their descent from Aaron. In the fourth century Arab tribes from Yemen began to encroach upon the Jews in Medina. They were divided into two clans, the Banu Aus andthe Banu Khazraj. By calling in outside assistance and treacherously massacring at a banquet the principal Jews, these Arab clans finally gained the upper hand at Medina toward the end of the fifth century (for date see "J. Q. R." vii. 175, note). From this time the Jews retired into the background for about a century. About four or five years before the Hegira the Jews took an active part in the battle of Bu'ath between the Banu Aus and the Banu Khazraj. The Banu Naḍir and the Banu Ḳuraiẓa fought with the Banu Aus, while the Banu Ḳainuḳa' were allied with the Banu Khazraj. The latter were defeated after a long and desperate battle. It is probable that the presence of Jews in Medina did much to prepare the way for Mohammed's teaching. When the prophet first went to Medina he was inclined to be friendly toward the Jews. They were included in the treaty between him and the inhabitants of Medina. He also made certain concessions to them on the ground of religion, and adopted their ḳiblah—Jerusalem—in the hope of winning them to his cause. They, however, ridiculed him, and delighted in drawing him into arguments to expose his ignorance; so that his conciliatory attitude was soon changed to enmity. 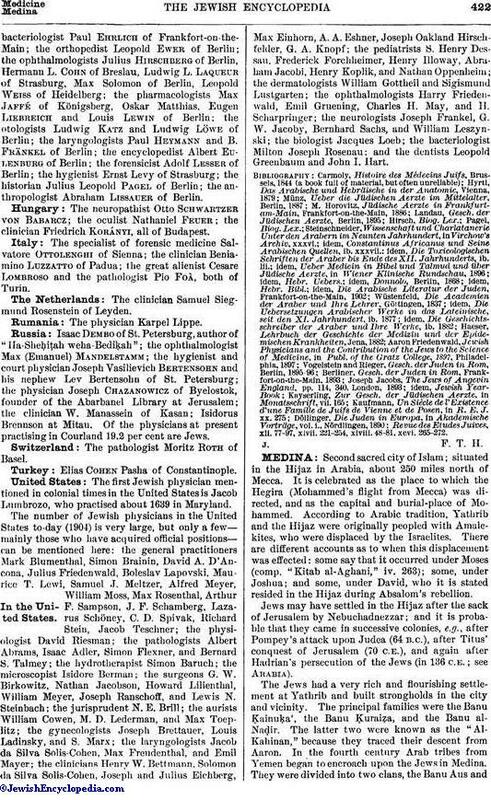 A few Jews were converted to Islam, among them Abdallah ibn Salam, whom Mohammed called the "servant of God," and of whose conversion the prophet made much. Finally Mohammed began to use actual violence toward the Medina Jews. After the battle of Bedr a woman called Asma, said by some to be a Jewess, wrote satirical verses, and was killed in her sleep, probably with Mohammed's consent. Not long before, Abu 'Afak of the Banu Amr, who had been converted to Judaism, had been assassinated for having displeased Mohammed by writing verses ridiculing the new religion. Mohammed then seems to have decided to get rid of the Jews in a body, since they were a constant menace to his cause. He began with the Banu Ḳainuḳa', who were goldsmiths, and lived by themselves in a fortified suburb. He first summoned them to accept his religion, and they refused. Soon a pretext was found for an open attack. 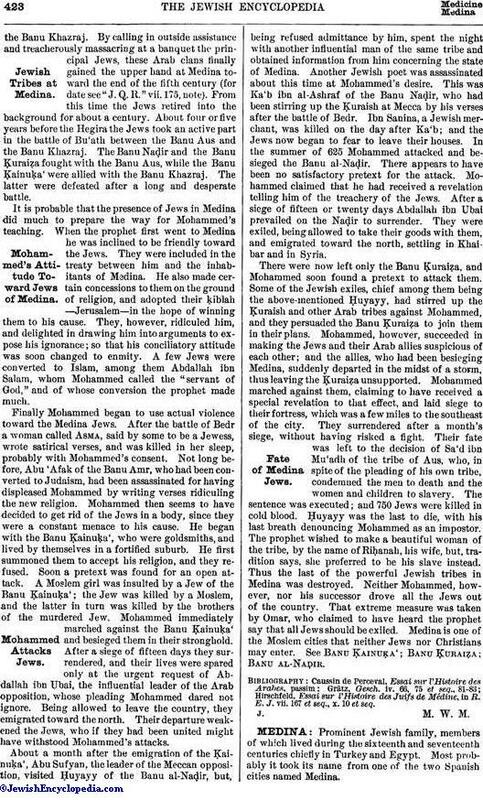 A Moslem girl was insulted by a Jew of the Banu Ḳainuḳa'; the Jew was killed by a Moslem, and the latter in turn was killed by the brothers of the murdered Jew. Mohammed immediately marched against the Banu Ḳainuḳa' and besieged them in their stronghold. After a siege of fifteen days they surrendered, and their lives were spared only at the urgent request of Abdallah ibn Ubai, the influential leader of the Arab opposition, whose pleading Mohammed dared not ignore. Being allowed to leave the country, they emigrated toward the north. Their departure weakened the Jews, who if they had been united might have withstood Mohammed's attacks. About a month after the emigration of the Ḳainuḳa', Abu Sufyan, the leader of the Meccan opposition, visited Ḥuyayy of the Banu al-Naḍir, but, being refused admittance by him, spent the night with another influential man of the same tribe and obtained information from him concerning the state of Medina. Another Jewish poet was assassinated about this time at Mohammed's desire. This was Ka'b ibn al-Ashraf of the Banu Naḍir, who had been stirring up the Ḳuraish at Mecca by his verses after the battle of Bedr. Ibn Sanina, a Jewish merchant, was killed on the day after Ka'b; and the Jews now began to fear to leave their houses. In the summer of 625 Mohammed attacked and besieged the Banu al-Naḍir. There appears to have been no satisfactory pretext for the attack. Mohammed claimed that he had received a revelation telling him of the treachery of the Jews. After a siege of fifteen or twenty days Abdallah ibn Ubai prevailed on the Naḍir to surrender. They were exiled, being allowed to take their goods with them, and emigrated toward the north, settling in Khaibar and in Syria. There were now left only the Banu Ḳuraiẓa, and Mohammed soon found a pretext to attack them. Some of the Jewish exiles, chief among them being the above-mentioned Ḥuyayy, had stirred up the Ḳuraish and other Arab tribes against Mohammed, and they persuaded the Banu Ḳuraiẓa to join them in their plans. Mohammed, however, succeeded in making the Jews and their Arab allies suspicious of each other; and the allies, who had been besieging Medina, suddenly departed in the midst of a storm, thus leaving the Ḳuraiẓa unsupported. Mohammed marched against them, claiming to have received a special revelation to that effect, and laid siege to their fortress, which was a few miles to the southeast of the city. They surrendered after a month's siege, without having risked a fight. Their fate was left to the decision of Sa'd ibn Mu'adh of the tribe of Aus, who, in spite of the pleading of his own tribe, condemned the men to death and the women and children to slavery. The sentence was executed; and 750 Jews were killed in cold blood. Ḥuyayy was the last to die, with his last breath denouncing Mohammed as an impostor. The prophet wished to make a beautiful woman of the tribe, by the name of Riḥanah, his wife, but, tradition says, she preferred to be his slave instead. Thus the last of the powerful Jewish tribes in Medina was destroyed. Neither Mohammed, however, nor his successor drove all the Jews out of the country. That extreme measure was taken by Omar, who claimed to have heard the prophet say that all Jews should be exiled. Medina is one of the Moslem cities that neither Jews nor Christians may enter. See Banu Ḳainuḳa'; Banu Ḳuraiẓa; Banu al-Naḍir. Hirschfeld, Essai sur l'Histoire des Juifs de Médine, in R. E. J. vii. 167 et seq., x. 10 et seq.